Take a coastal path to visit St. Mary Magdalene. If you want to pair exercising with the history of the city, I recommend walking or running on the coastal path to the Franciscan monastery, which is located in the neighboring village of Porat. 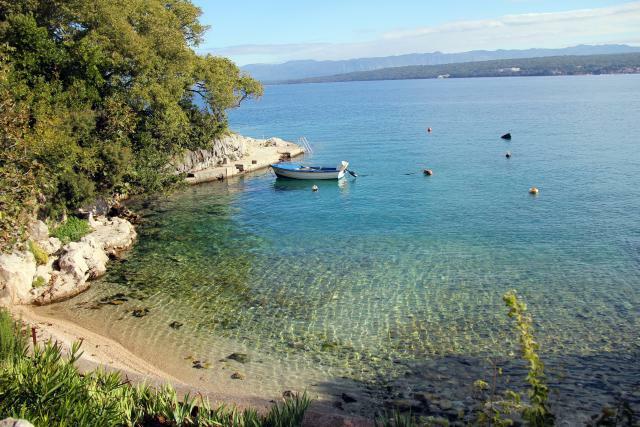 From the center of Malinska, to the famous village of Porat, you are going to walk on a nice coastal path, which will help you, to really feel this place, and at one, discover different bays, which are not located in the center of Malinska. While exploring the city, me and Tomaž also decided to go on this route and at the same time visit the famous monastic monastery, which stands next to the church of st. Mary Magdalene. The monastery is now a museum with a collection of sacred, as well as useful objects from the past, which were used in everyday life. So started our path from the center along the well-known Mulino beach, which is located by the restaurant with the same name, aqua sports center, aqua park, concrete and pebble beach with sun beds and showers that are also accessible to people with disabilities. Along the coast there is a small park, with a shop next to it.Along the way, before our eyes appear a series of beautiful beaches, coves and gardens, which leads from many apartments and hotels that are located nearby. 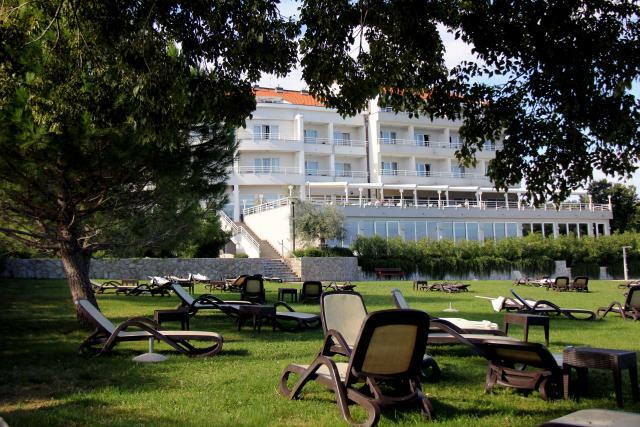 Extremely fine was small grassy park of hotel Vila Rova, surrounded by olive trees, where you can enjoy and relax on deck chairs and look at the sea while breathing in the aromatic environment. The way will lead you along the Blue Waves Resort hotel, with its own restaurant situated on a unique location next to the sea. Along the way we crossed a series of small marinas, where boats are anchored by locals. It was really nice to watch those seaside cottages, build of stone, surrounded by palm trees and decorated with fishing nets, which are an excellent match with their sea-colored shutters. This location is also very plant based, if you pay attention you will notice all the characteristic Mediterranean plants, which will accompany you along the way. Like various flowers, (cacti, trees, etc). After about 5 miles you will arrive in the harbor village of Porat, which was built before the one in Malinska. At this port, fishermen from all places used to gather, because this was the main point where they united in fishing company “Kumpanija”. From the port in Porat you will have to go uphill a bit, it will take you through the city, towards the famous monastic monastery built in the 1480th. 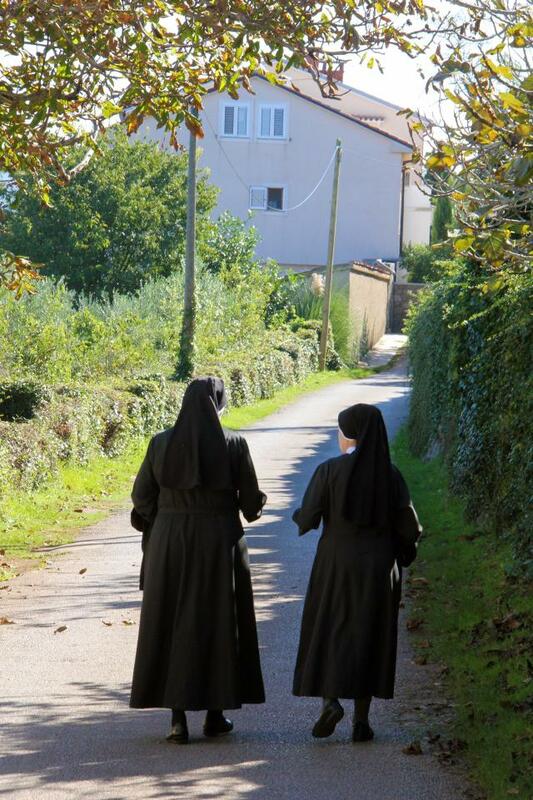 From a distance, you may notice some nuns, who are usually walking around the area. To view the museum with a sacred collection, ring the bell at the gate, which is located in the corner next to the St. Mary Magdalene church, which dates back over 500 years. There will always be someone, who will recieve you and show you around the museum collection, where you will see a series of historical books, old monastic clothes, copies of the most important Croatian Glagolitic records, stone monuments and other objects. Then you will enter the premises, where they have stored Old-device called “Tos”, which was built in 1850 in the monastery for the processing of olives. On the room walls you will as well see a range of agricultural tools. When you visit the museum is suitable, that you write something in the guestbook, because that means a lot to the caretakers. Next to the book, there is also a box where you can insert a few coins, which are intended for the maintenance of the Glagolitic monastery, which by the way is called (trečeredci). If you decide to visit a little bit of Porat while you are there you can continue the path past the monastery, and you will see a luxury hotel Pinia with a really beautiful grassy garden with some sun loungers. We have not yet stopped there, but we walked about 2km over the coastal forest path and looked some more of the province and its bays.